WALLINGFORD ― Doc Cavalier stood in the middle of the "big room" at Trod Nossel Productions & Recording Studios, and snapped his fingers. "It's got very good acoustics ― about a second and a half," he said. "You snap your fingers, and it's about a second and a half before you really hear the bounce ― which is perfect." Naturally, Cavalier knows all about this stuff, and things like "square waves," which he assured me have been eliminated from the big room by rounded walls. "Nothing is square here," he said. He talks in the cadence and language of a hipster pop music man, and dresses in an amalgam of rock 'n' roll styles ― on this day wearing jeans, what looks like a long-sleeve thermal T-shirt, a multi-pocketed nylon vest and expensive Mephisto walking shoes. Lighting in the recording studio is muted, but Doc has his black sunglasses perched alternately atop his gray, free-range hairdo and the tip of his nose. When asked, Cavalier, whose given name is Thomas, admits to no chronological concept of age. "Wise enough to know better than to answer," he said, between sips of coffee and drags on one of his ever-present Nat Sherman Natural Lights. "To me, I've seen 17-year-olds that were acting like 80-year-olds and 70-year-olds that just can't have enough fun for the day." Cavalier has been having fun recording in Wallingford for more than 30 years, inside the modest-looking building at 10 George St. He was once a dentist ― hence the nickname ― but music quickly took over, and he started in the business by managing acts like the Shags and Bram Rigg Set. "I was actually managing bands and booking them from my waiting room while patients were getting numb," Cavalier said. He gave up dentistry after about six years. And he says that even now, he can't wait to have at it every day ― on only two or three hours of sleep a night. "I usually wake somewhere between 1 and 3:30 (in the morning)," he said. "I open up my computer at home, check all my e-mails ... and get off everything I have to get off, like to England, which is six hours ahead, and Japan, which is a day ahead." He's in the office, he said, somewhere between 2 and 4 a.m.
"They're magical hours for me," he said, sitting in a control room off the big room. "I always consider it a like coming up on an altar when I come in here." Cavalier started out as a customer of what was Syncron Studios, buying recording time for the Shags. When Syncron, which also made microphones, ran into hard financial times in the late 1960s, Cavalier came in and bought the place. "The entire investment, initially, was $75,000," Cavalier said, "but you know, that's 30 years ago. So you know what that is today." A few years later, he changed the name to Trod Nossel, which Cavalier said means "tree of many branches." Today the studio staff of 10 includes two of Doc Cavalier's sons, Tom and Rob Cavalier. Chief Engineer Richard Robinson, a Wilcox Tech graduate and a former University of Connecticut engineering student, has been on board for more than 20 years. "I just walked in and said, 'I want to be in the recording business,' " Robinson recalled. Over the years, Trod Nossel has built a roster of familiar acts that recorded or had recordings mixed at the studio. The list includes Joe Cocker, Chic Corea, Donovan, Michael Bolton and Taj Mahal. Fleetwood Mac once performed there, in one of 27 studio concerts broadcast by WPLR. The Wildweeds, Al Anderson's pre-NRBQ band of the 1960s, had a regional hit called "No Good To Cry," that was recorded at Trod Nossel. The band and the studio, however, wound up parting less than friends, as Anderson, who eventually moved on from NRBQ to a songwriting career in Nashville, called Cavalier's operation second-rate. "All I can say is I made him a star," Cavalier said. "Those songs stand up, and it wasn't that the equipment wasn't good ― the equipment was what it was at that time. The fact is, I've been here for 31 years." Other bands have left with fonder memories of Trod Nossel. "That's where we got our start," said Jedediah Parish, whose Boston-based band, the Gravel Pit, was formed in New Haven. "We recorded there in 1988 ― We did, I think, six hours for $600. It was some kind of demo deal, I think, and we did six songs. It was hysterical." Parish said he misses those days when recording was a little more personal, and a little less technological. But the science of music has grown irretrievably in a digital age, and Cavalier says the studio has kept pace. "Technologically, we're starting to have the tools that a lot of people feel we really needed," Robinson said. "The stuff we used to have seems crude ... but then you listen to this old stuff and you say, 'wow ― we were good.' 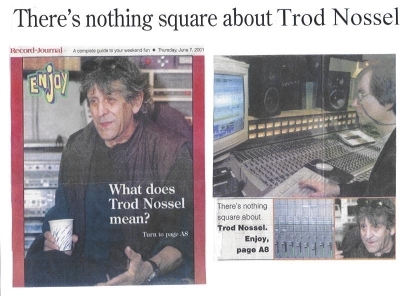 "
Trod Nossel uses a software and hardware package called Pro Tools, to record multiple tracks, putting and pasting the best of each take into a final product. The sophistication of computers, Cavalier says has allowed the studio to offer a base price of $49 an hour to its recording customers ― many of whom are fledging artists hoping to catch on with a major label. "We're as good as, if not better than, most of the major recording centers," Cavalier said. "But we do so many things ― we publish, we manage ― I'm able to give the client what I consider a fair rate for what we do. "You can put together an album for $2,000 or $3,000, or you could spend 50 or 80 (thousand). But no one's ever spent 80 here, except for labels that came here and said, 'We want it this way, and that's it.' "
Copyright © 2002-2004 Doc Cavalier. All rights reserved.